Diverse, delicious and not as difficult to cook as you might think, Indian food is among the leading cuisines of the world. With every state, city, and even every home having its own recipes for thousands of dishes, you can imagine how the variety is absolutely mind-boggling. Contrary to popular belief, Indian food is not just about curry, chilies, and oil. There is probably no other cuisine in the world that includes as many healthy and diverse vegetables and spices. At the same time, Indian cuisine is not just for vegetarians. If the worldwide popularity of butter chicken, rogan josh, vindaloo and fish Amritsari is anything to go by, Indians know a thing or two about pleasing the non-vegetarian palate. In India, cooking is considered an art. Mothers usually begin to teach their daughters fairly young in life, passing down family recipes by show-and-tell. As a matter of fact, food is very serious business. In most Indian homes, even in this day and age when most women work outside the home, if one is not cooking or eating a meal, one is planning what to cook next. Meals almost always include several dishes, dessert, and a staple or two like rice and chapatis. 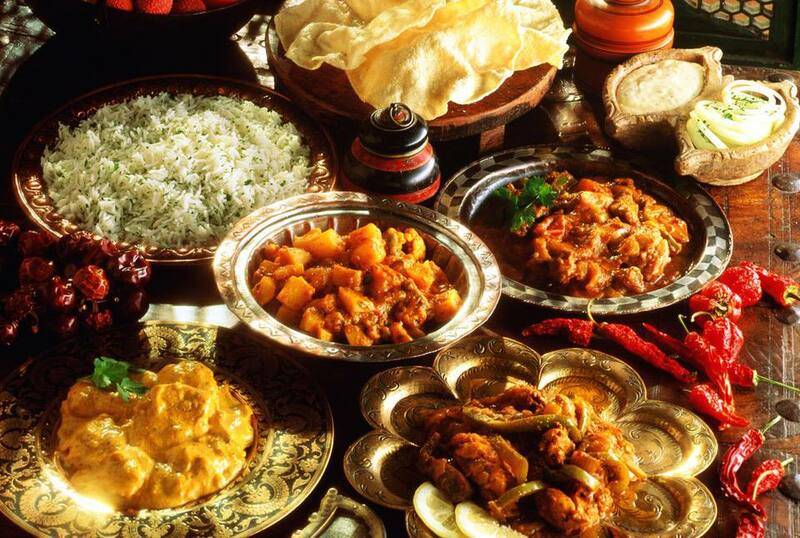 Over the course of history, various invaders have passed through India and left their stamp behind on its cuisine. There were Aryans, Persians, Arabs, the British and the Portuguese to name just a few. The result are dishes that are so delicious, some of them are legendary. Think of India and one of the first things that comes to mind is its diversity. A large country, its population is second only to China, its languages are numerous and every state (of which there are 28 and seven Union territories) is unique in its traditions and very importantly, its food. In fact, food from one region may actually be totally alien to a person from another region. There are distinct cuisines for North, South, East and West India. With all its diversity, It is ironic then, that when the rest of the world thinks of Indian food, the one word that comes to most minds is curry. This is perhaps the greatest understatement ever as curry does not begin to sum up the amazing variety that is to be had in Indian cuisine. Other misconceptions include that all Indian food is spicy, fatty, rich, or hard to cook. Curry powder is actually a British invention trying to imitate some of the flavors found in Indian food. In India, cooks use a mix of spices collectively known as garam masala. It is often made fresh and varies from household to household as well as regionally. With so many languages and each region having its own food specialties, the list of terms used can be exhaustive. They can also be confusing for a novice to Indian cooking. If you can't tell an achaar from a biryani or chai from an idli, you will need to do some studying of Indian cookbooks to get a sense of the different dishes, ingredients, and cooking techniques. You will be surprised at how little you actually need, in terms of dishes and utensils, to cook Indian food. Most of the tools and pans will be those you already have on hand. A wok, a set of heavy-bottomed pans, a pressure cooker, and a steamer will be enough to cook most dishes.